My wife is pregnant. I’m told I have a grin on my face people can see a couple hundred miles away. Now she’s not due until summer, and we’re still in the first trimester, but today is the day of small beginnings. I mean you don’t get much smaller than an embryo. Mustard seeds look pretty good in comparison. And it’s easy to value and think an unborn child is precious. It’s very easy. For those people who find it easy to not value unborn life… I feel sorry for them and will probably pray for them every day between now and the birth of our child. But if it’s so easy for us to value an unborn child that is truly a small thing in these days for me at least, then why is it so easy to not value something small and simple in life? I wrote about a five dollar pay it forward promise. I had these huge dreams and visions of it going viral and just exploding beyond imagination. I wanted to see the world moved in generosity and the power of God when people decide to open up their hearts. Well the people I tried to get involved didn’t really pan out. I think two of the five actually donated money and only one of those tried to get anyone else involved. I was DEPRESSED! I mean I was really let down here. But that’s still three people who were effected enough to give to someone else this Christmas. Dan King of BibleDude.net talks about building a playground for orphans in Haiti. And good reason to build a playground there is solid social benefit to doing this, this isn’t just so that some kids can goof off, even though that in itself is important. I reply to you, that a playground is an unborn child. 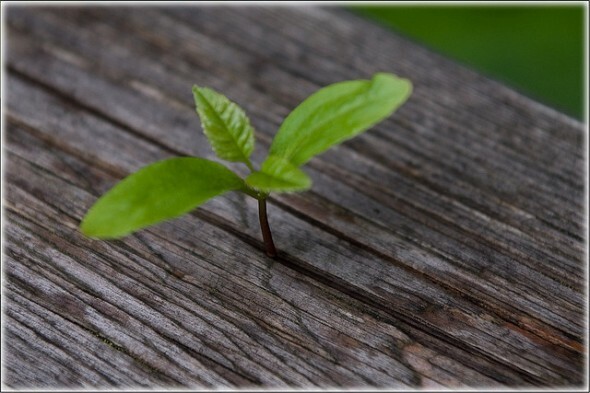 It is a day of small beginnings that will grow. How or why are unimportant in this moment. It will grow and it is our responsibility to make sure we value it. That five dollars you donated are precious. That pair of shoes you donated are precious. That smile you offered while you held the door for someone is precious. And not just to the person receiving it. God granted us a child and that child is precious to us, do you suppose it is meaningless to Him? Welcome to the day of small beginnings. Editor’s note: If you’d like to support the playground in Haiti project, you can donate online here. I love your comparison of the playground and the unborn child. I thought of laughter and smiles on children’s faces, a sun-shiny day. 🙂 Thanks for sharing your heart. I was in Haiti a couple of months ago, and while we were there our team led a VBS program for the kids. It was AMAZING to see the joy that just playing and being kids brought to their lives! Simple things like balloons, blowing bubbles, and beach balls made kids just light up! I agree with Seiji… sometimes it’s hard to understand why this is important, but that laughter and smile that you thought of is what being a kid is all about. Thanks for stopping by Brock! Hey it was my pleasure to guest post here. God’s really been convicting me lately about how I personally tend to dismiss small or little things although with this new perspective I imagine it’s going to get a lot harder!